Adapter design pattern provides unique INTERFACE to the outside world for different functionality encapsulated in separate implementations. Does it sound familiar? Let’s look at SAP BAdI having multiple implementations where all of them are called the same way (using the same inputs/outputs) but the purpose and functionality of each of these implementations can be completely different. WRITE: / 'PO Address is being modified'. WRITE: / 'Vendor address on PO is being modified'. lo_po_change TYPE REF TO lif_po_change. CREATE OBJECT lo_po_change TYPE lcl_change_address. 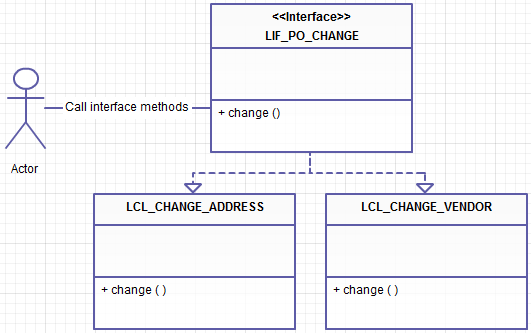 CREATE OBJECT lo_po_change TYPE lcl_change_vendor. This entry was posted in ABAP, Algorithms, Behavioral patterns, Design Patterns, Development and tagged ABAP, adapter, design patterns, interface, OO ABAP by Spider. Bookmark the permalink.